This beautiful Lacquered Wood Lockable Chest Cremation Urn is made of hardwoods with a deep, rich stain that has been laquered to bring out the beauty of the wood as well as to protect it. The lid of the urn is decorated with inlaid burl surrounded by decorative wood inlay. Each urn is crafted and finished by hand so every urn will have slight differences in color and inlaid design, making each one unique. 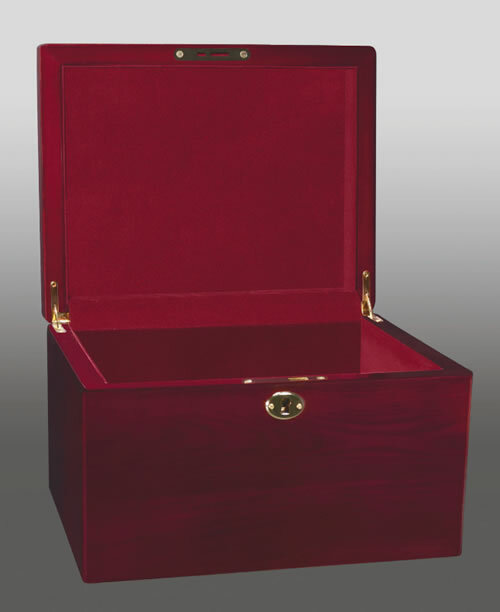 This chest urn is lined with soft rich material and opens and closes with hinges not visible from the outside. (View the inside of the urn by clicking on the tab titled Detailed Images.) This is one of the few chest style urns that locks for safety.